The Pacific Northwest is the region of the U.S. that has been most associated with Generation X, which is part of the reason I feel such a connection to this place. I love Portland for the way that a paper cup of hot coffee warms up my hands as I stand in the soft rain and wait to cross the street. I love this city for the way the air is full of the scent of Evergreens. 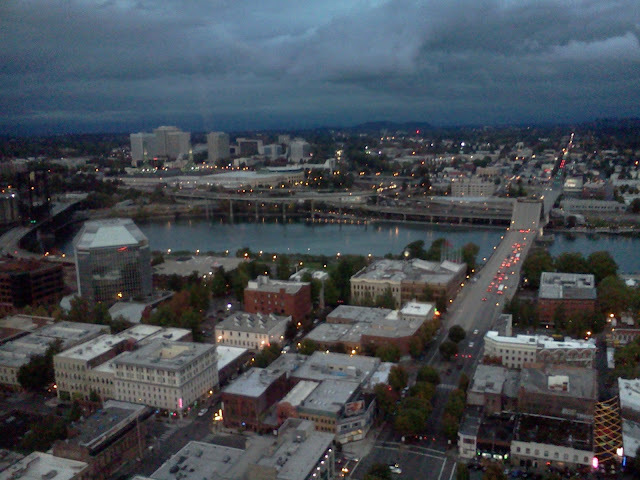 From this overcast sky and the bridges over the rivers of Portland and Seattle, a way of life infiltrated our consciousness in the 1990s that was the antithesis to the 1980s - living more green and simplifying more. Kurt Cobain talked about realizing how much happier we can be by going to a thrift store of pre-owned things and stumbling across an unexpected treasure instead of going into a nicer store with a lot of money to buy everything in sight. Looking out at these streets, I think of all the Seattle Grunge Era bands that played here in these buildings just before they became famous - fighting back against the corporate machine with their guitar riffs. Those were my teenage years. I also think of all the Gen Xers like me that were twenty-somethings, finally done with college but with daunting student loans, making their way up these streets and up elevators to find temp jobs to hold us over one weekly paycheck at a time. 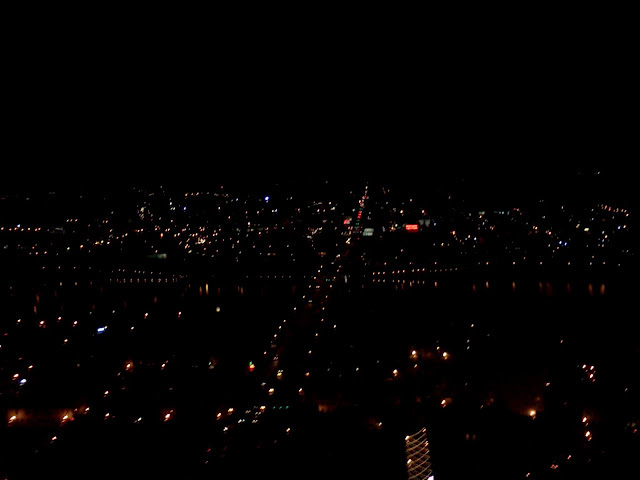 In those days, I used to look out through glass buildings at a view just like this when the sun was going down and the city lights were just starting to sparkle. I'd dream of being a writer. When talking about success, Cobain mentioned that he was the happiest before the enormous fame came to him - when they would be playing live at some small venue, or when he was dreaming about how good things would be someday. And this concept keeps coming into my life - that we spend a lot time thinking of the way things maybe will be or could be, but we can be happy now - that what we have now is enough. People always ask me how or why I ended up here ten years ago. There's a lot of reasons - the main one is that I knew in my heart that I was supposed to be here. I came here with just a small car full of things and no job or place to live and I started a new life for myself. The Pacific Northwest had always had a draw to me from the first time I visited here as a child looking out at the passing Evergreens on the winding mountain roads. 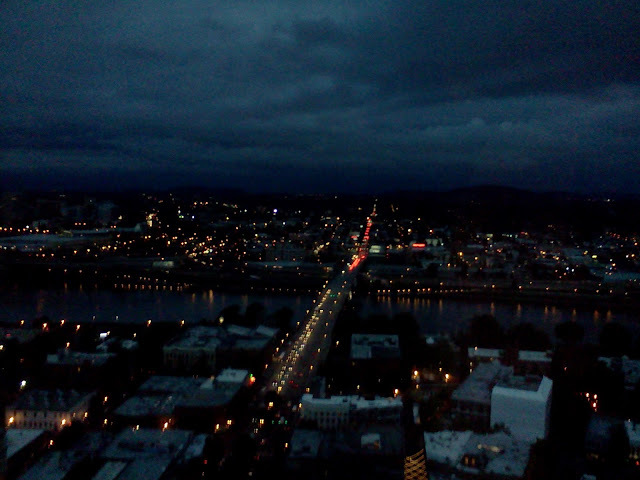 I love the way the lights reflect on the Willamette River as the soft dark blue glow covers the city. I'm so happy I'm here. I'm grateful for what I have learned from this corner of the world - where the land comes to an end and the Pacific Ocean laps up onto the shores. Night comes and the shining dots of light show you where the river's edge begins. I love Portland. Bright pink fallen blossoms around my feet while walking around SE Burnside Street in Portland - I snapped some shots to capture this fleeting window of time we are leaving behind - when the blossoms begin to fall to make way for the unfurling of green leaves. This is where you might be finding yourself right now - you've seen too many things around you fall and fall apart. But you're forgetting about the unfurling - the new beginning that awaits you. If your plans, or your hopes, or your art has seemed like these blossoms - trampled underfoot on a busy sidewalk - maybe that was just a way to make space in your life for new and better things to come. Today is Orthodox Christian Easter - also known as Pascha - the Hebrew word for Passover. Orthodox Christianity waits for the Jewish Passover each year before we celebrate the resurrection. And I am always so in need of a new beginning by this time of the year - for a resurrection in my faith, and in my hope. Whenever I watch the falling of things - the falling apart of things - I need to remember that this is not an end in itself. This is a way of making room for things to come.